Hi, I′m Dan Richmond, and you′re about to get hold of my break–through SEO in Practice guide. I stay online 24 hours a day, so sure, I know today′s situation with SEO books. There′re just so many of them!!! And yes, I know someone may be skeptical. But I may ask SO WHAT? I′m serious about making this book the best practical SEO guide ever, and here′s the only way to prove this: check how it works. So right now, in the book′s introduction, I′ll just try to answer the important questions you might ask me before you start. And then we′ll get straight to action. Firstly, here′s a couple of words about why I wrote the book. For ten years I′ve been a professional SEO, I worked out winning strategies using the try and error method. Now I believe I′m expert enough to put the best of my experience into a practice–oriented SEO guide. TO MAKE GOOD MONEY WITH MY WEBSITE? Now tell me honestly, among the hundreds of SEO books on the Internet, did you see any that teaches the exact simple steps to get to the top? So take me for a humbug if you like, this tutorial is unique. It answers the "what–should–I–do" questions my clients keep asking me for years. I know you also have some general questions about SEO. Same thing, I answered them a million times and now′s yet another one. To SEO or not to SEO? If you check it on the Web, you′ll find there′re other ways to get traffic ( = visitors ) to your site and thus to make money. Say, pay per click campaigns (PPC) like Google AdWords, Yahoo! Search Marketing, or Bing Ads. Here′s what I can say, and it′s not a personal opinion, but a common fact: PPC brings results fast, but you have to pay all the time. The sums get rather big. And you never know for sure, whether PPC will pay for itself, or it′s just money down the drain. SEO is different, in terms of investment and effect. First you pay (and all of us SEOs know that real optimization costs are not that big), and some months later you start getting dramatic results. Yes, SEO pays for itself hundreds of times better, in the long run. The amount of traffic that SEO may bring you is unlimited. You′d simply go bankrupt trying to get as many visitors with PPC campaigns. Read what happened to one of my clients: in March 2006, they launched a new online gift store. At once, they started a PPC campaign and spent about $40,000 within 3 months. In return, it only brought $28,000. At the same time in March, I started an SEO campaign for them. All in all, it cost less than $14,000 (including my charges, which are quite big). And, by December 2007, the estimated gain from SEO was $122,000, which is 4.4 times more than Pay Per Click could bring. As you can see, even if you pay an expert to optimize your company′s site, this pays for itself dozens of times over! And if you do SEO yourself, your costs are so small, and your profits can exceed them by not even dozens, but hundreds of times! Thus an ideal solution is, go ahead with SEO, and launch a PPC campaign at the same time, to get some traffic from it before your SEO efforts start bringing you real money. And remember: PPC brings pennies, compared to what you get with SEO. Should I do SEO myself, outsource it to a freelancer, or pay an SEO company to do it for me? What if you hire a freelancer? Firstly, you can never trust he′s doing it right. What if he goes the wrong way and your site gets banned? How are you going to control an outsourcer? Moreover, he will ask for a fat sum. Read this Search Engine optimization guide, and you′ll know how to check what a freelancer′s doing at any moment and what it′s really worth. And, if you trust them to start your SEO campaign from scratch, they will do exactly the same things you can do with this book, or even less — but you′ll have to pay thousands of dollars, monthly. Now, please think of yet another thing: my clients′ businesses gained over $37,000,000 due to web promotion. And believe me, the best part of these 37 mln could have been made without my assistance, had my clients read this book. Read this SEO guide, and I′ll be sure that you′ll never pay an SEO company more than they deserve. DIY is free, but requires knowledge and time. Yet with this book in your hands, you′ll get all the knowledge you need. And it′ll save you a lot of time, firstly, because you don′t have to educate elsewhere, and secondly, because it teaches you to make abundant use of SEO tools that make it hundreds of times faster. And, it′s not at all hard. All strategies I provide here were devised for real–world clients in order to earn real–world money. And here′s my word: to make a boom of sales, you need the simple universal things I teach here. Call it a schedule, a manual, or whatever — this book is like taking you by the hand and guiding you, step by step, up to the point when you break a bank with your site. When Internet users look for information, services or products to buy, more than 8 out of 10 rely on Search Engines, not simple surfing. 85% of these searchers don′t click on paid links. 63% of links that are naturally displayed at the top of Search Engines get clicks. Being naturally found at the top (due to SEO, not to payment) converts 30% higher ( = brings 30% more money). as long as you start, do SEO (whichever way you like), and use this book. Mind it, with this guide you′ll be in fact doing things a professional SEO would do — and it′ll turn out easy and free! After that, when your site is flourishing, you can afford to pay for very sophisticated SEO tricks. Yes, a grown–up site may need personal approach. So that will be the right time to hand it out to SEO experts (of course if you find that necessary). Who can do SEO or Who is this book intended for? The short answer is: everyone. Anyone who could be my client will save a fat sum and gain much more — all with this book. And among my clients, there were medical centers, financial consultancies, music shops, wildlife refuges and what–not. I knew a guy who was selling pottery on the web and a woman who founded an Internet community for people with lung cancer, a young lady who had an online art gallery and two brothers who owned a transportation business. Thus if you have a website, you′ve come to the right place. And, it′s time to see how you can make it work, free of charge! Now you′re mere seconds away from getting the first portion of my instructions. So don′t delay, get down to your SEO guide right now, and push your website to the top! I have gone through you post but not completely agreed. as we have been watching for last 2-3 months Google have pushed organic listing down the fold and the page is filled with all of the Google ads in this condition in first instance everyone will click on no where else than Google ads. I think now scenario has been changed Google is pushing down the organic results intentionally. going forward accept this debate a would really like to know about latest Google update and their effects on SEO ranking. At first ,I really donot konw what is SEO .but now ,I have learned a little .I am learning sth about SEO. I am new larner of SEO. I just start reading your book. Its really impressed me already thanks for sharing a awesome book with us. SEO and SEO I love it and live it. I am doing SEO Jobs these days and i have completed my Graduation. Every says me are you sure with seo as career i said yap. Why don't you try software development. ! i said na.. I am deep in love with seo these days. It's funny how one can be involved with IT for twenty years and not have a clue about SEO. Retired now and trying to build a free member site dedicated to small online business startups, SEO is an area I have little experience with. 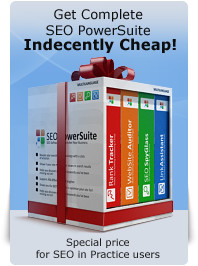 I have learned so much with SEO powersuite and this guide I feel confident I can get my rankings up before I launch.. Ill be sure to send people your way for the SEO section... Thanks a truly in your face factual account of SEO. Great work here Dan.I am going through all this and benefiting from the knowledge. thanks for giving such a wonderfull guide.i am very thankfull to you dan.I am actually now became a big fan of you. Hi Dan, good stuff what you have done here. SEO is definitely still the best source how to get more sales in internet. Do you know when the pdf version of this book will be ready? Keep going! Please log in or register to leave a comment.